In 2014, the NHTSA has proposed a new Federal Motor Vehicle Safety Standard (FMSS); proposal No. 150 would require all passenger vehicles to have minimum vehicle-to-vehicle (V2V) communication capabilities by 2020. 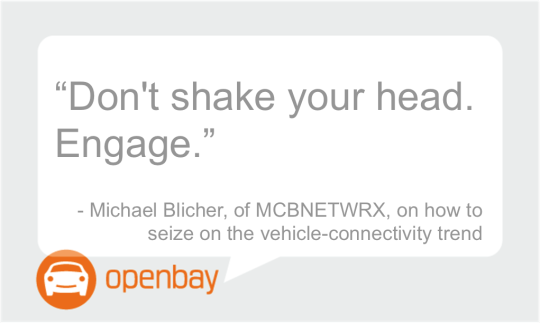 “It lit a fire,” said Blicher, encouraging the first wave of connected car pilot deployments. Now, in 2016, standards are being introduced to define what’s happening with that activity. The goal of V2V is to develop and introduce of a number of advanced vehicle safety applications in order to help prevent accidents. Why would it be required? If only one vehicle has V2V, there’s no benefit; the mandate was created in order for V2V’s safety strides to be quickly realized. 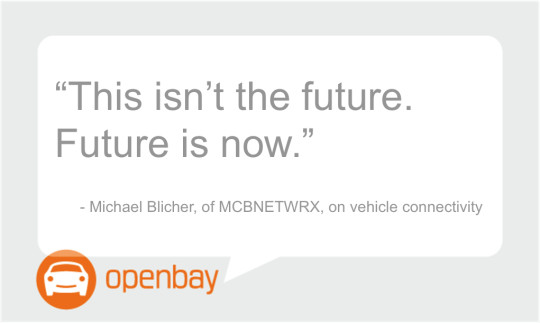 Blicher went on to describe how much work has already been done to implement vehicle-to-vehicle communication, saying, “This isn’t future. Future is now.” He continued, “No longer will it be an idiot light” warning drivers about their own vehicles; in the near future, drivers will be able to receive communication about what’s happening on the road ahead. Collision warning and lane assist technologies, for example, have been instrumental in the safety of individual vehicles, and V2V communication will that that a step further. If a car well ahead of you has driven through a weather front that had crossed a highway, filling it with ice, you’d be notified well in advance. What Was as Big as This Will Be? Vehicle connectivity to other vehicles, to the infrastructure (V2I), and to pedestrians “is the ‘Internet of Something Big. … All the jobs that will emerge from this aren’t even known,” stressed Blicher. The aftermarket will have huge opportunities to create value in ways that include retrofitting vehicles, developing and storing the hardware, and training current and new technicians on installation. To illustrate the scale of the work ahead, to prepare vehicles and roadways, Blicher compared V2V communication to the development of the Interstate Highway System, formed in 1956. Work will have to be done at the federal, state and local levels, and in a “unified implementation layer,” similar to the uniform signage displayed across nearly 50,000 miles of the U.S. highways. The types of data distribution will have to be large and small. Data collection will be stretched across 3,000 miles of the U.S., and broadcast to NASA “in a broad, but anonymous way,” while collecting and sharing information in much smaller measurements, about vehicles’ status within lanes. As with coordinated universal time (UTC), there will have to be a common understanding of location. Where is the Government Investing in V2V Pilot Activity? Michigan: (perhaps the easiest location to guess) 67% of all automotive intellectual capital is ‘touched’ in southeastern MI. Ann Arbor, outside of Detroit, has a test center with 73 miles of connected roads, and there’s 120 miles of highway with connectivity capability. Already, more than five-million V2V pilot trips have been completed in Ann Arbor. 45 more streets, and 12 freeway sites will be added in 2016. Florida: Because it’s the Disney vacation state, it’s a natural testbed. Florida has advanced highways, and had been early adopters of high-speed tolling. Plus, there are large rental-car fleets; perfect for testing vehicle-to-vehicle communications. Wyoming: this is useful for large trucks, used by the likes of Fedex and UPS that take longer journeys to other states. It’s a perfect place to develop technology for ‘platooning,’ where there’s a lead driver with other autonomous trucks following, to improve safety and fuel economy. New York: with eight-million people in New York City, it’s a good place to test V2V communication, as well as P2V, or pedestrian-to-vehicle communication. Already, some companies have seen success from the emerging trend in vehicle connectivity. Brandmotion, based in Southfield, MI, installs and sells aftermarket mirrors and 360-degree cameras. It joined the affiliated test bed in nearby Ann Arbor, and has since provided hardware to the test vehicles, and now, several thousand installers are being trained on how to implement their service. Thanks to AutoCare’s YANG group for arranging the presentation, and to Michael Blicher for giving the auto care industry a glimpse at what’s ahead. If you liked this presentation, check out the recap of AutoCare’s webinar about Challenges & Trends in the Future of the Automotive Aftermarket. If you haven’t already, check out Openbay, the online marketplace for auto repair. We’re proud members of the Auto Care Association, and send our biggest thanks to them for encouraging such useful dialog on industry trends. This entry was posted in Car Tech and tagged auto, car, car repair, connected car, vehicle connectivity. Bookmark the permalink.